The chart below shows SST monthly anomalies as reported in HadSST3 starting in 2015 through January 2018. A global cooling pattern has persisted, seen clearly in the Tropics since its peak in 2016, joined by NH and SH dropping since last August. An upward bump occurred in October, and now again in January 2018. As will be shown in the analysis below, 0.410C has been the average global anomaly since 1995 and last month remains lower at 0.376C. SH rose along with the Tropics, while NH held steady. 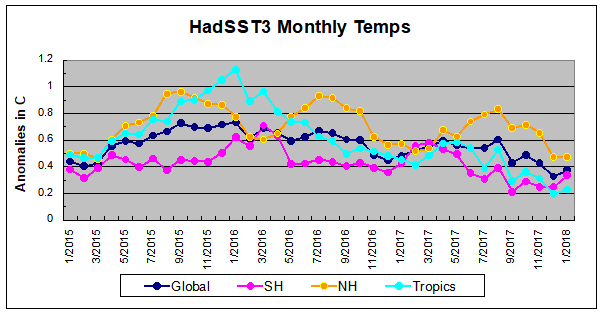 Global and NH SSTs are the lowest since 3/2014, while Tropics SSTs are the lowest since 3/2012. SH is the lowest January since 2014. Arctic Ice Swirls End of Feb. Under the influence of a split vortex in February, Arctic ice is also a bit bi-polar. Above image shows the Atlantic side the last two weeks. Barents on the right has grown back to reach the 11 year average, while on the upper left Baffin Bay is above average reaching down to Newfoundland and filling in the Gulf of St. Lawrence. Meanwhile, the ridge of high pressure over Alaska resulted in Bering on the right losing ice while Okhotsk on the left gained up to last year’s maximum. Ice extents for February appear in the graph below; 11 year average is 2007 to 2017 inclusive. Note that ice growth slows down in February since the Arctic core is frozen and extent can only be added at the margins. MASIE shows 2018 is drawing close to 2007 and 2017, while SII is running about 200k km2 less. The 11 year average reached 15M km2 while this year is ~500k km2 lower at day 57. Below is the analysis of regions on day 057. Average is for 2007 to 2017 inclusive. The 2018 deficit to average is almost entirely due to the shortfall in Bering Sea. Barents, Chukchi and Okhotsk are all about average. A large surplus in Baffin Bay/Gulf of St. Lawrence offsets smaller deficits in Central Arctic and Greenland Sea. The annual maximum usually occurs mid March. 2018 is now 2% below last year’s max and needs 3.5% more extent to reach 15M km2. And here’s your PC candy for Valentine’s Day. Breathless news out of Colorado Climate warming causes local extinction of Rocky Mountain wildflower species Excerpts below with my bolds. New University of Colorado Boulder-led research has established a causal link between climate warming and the localized extinction of a common Rocky Mountain flowering plant, a result that could serve as a herald of future population declines. The new study, which was published today in the journal Science Advances, found that warmer, drier conditions in line with future climate predictions decimated experimental populations of Androsace septentrionalis (Northern rock jasmine), a mountain wildflower found at elevations ranging from around 6,000 feet in Colorado’s foothills to over 14,000 feet at the top of Mt. Elbert. The findings paint a bleak picture for the persistence of native flowering plants in the face of climate change and could serve as a herald for future species losses in mountain ecosystems over the next century. Always the curious one, I went looking for context to interpret this report. Thank goodness for the Internet; it didn’t take long to find information left out of the alarming news release. From the US Wildflower Database (here) we can see the bigger picture. 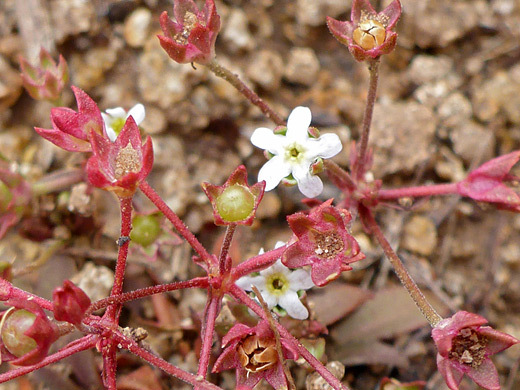 Androsace septentrionalis is a small-flowered and rather inconspicuous plant, and is the most common member of this genus in the West, out of six in the US. Plants are very variable in size, reflecting the wide range of habitats and elevations – from near sea level to over 11,000 feet. Stalkless leaves grow at the base, in a flat rosette, and often have a few teeth along the margins, and ciliate hairs. Leaf surfaces may be hairless or sparsely short hairy. Look at the range and habitat and ask yourself if this plant is adaptive, as well as the fact this species is the most common out of six in the genus. And in Minnesota (here), on the eastern edge of the range, it is rare compared to the Western Rock Jasmine (Androsace occidentalis). If American lotus (Nelumbo lutea) is noted as Minnesota’s largest native wildflower, Western Rock Jasmine certainly vies for its smallest. It can have very dense populations but it takes a discerning and determined eye to pick it out of the landscape, and is only of interest to those who celebrate the diversity of nature. It is easily distinguished from its rare cousin, Northern Androsace (Androsace septentrionalis) which is larger in stature and has rather narrower bracts at the base of the flower cluster. The preferred habitat features sun; dry sandy soil, grassy meadows, open fields, disturbed soil, which along with “rock” in the name suggests that these plants tolerate arid conditions. Far from going extinct, these flowers abound and like humans adapt readily to their surroundings. As has been stated previously, when alarmists project large numbers of extinctions due to future climate change, always ask for the names and the dead bodies. What the headlines claim is refuted by the facts on the ground. 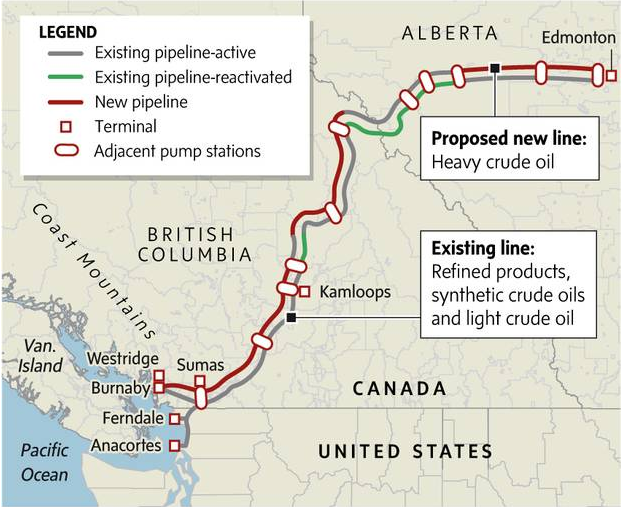 The inter provincial Canadian war over a bitumen pipeline is taking on Shakespearean drama as reported in the Globe and Mail The symbolism of Kinder Morgan’s Trans Mountain pipeline The article is by Arno Kopecky, an environmental journalist and author based in Vancouver. Excerpts below with my bolds and images introducing the principle players. Spare a thought for Rachel Notley. While you’re at it, spare another for John Horgan and Justin Trudeau. 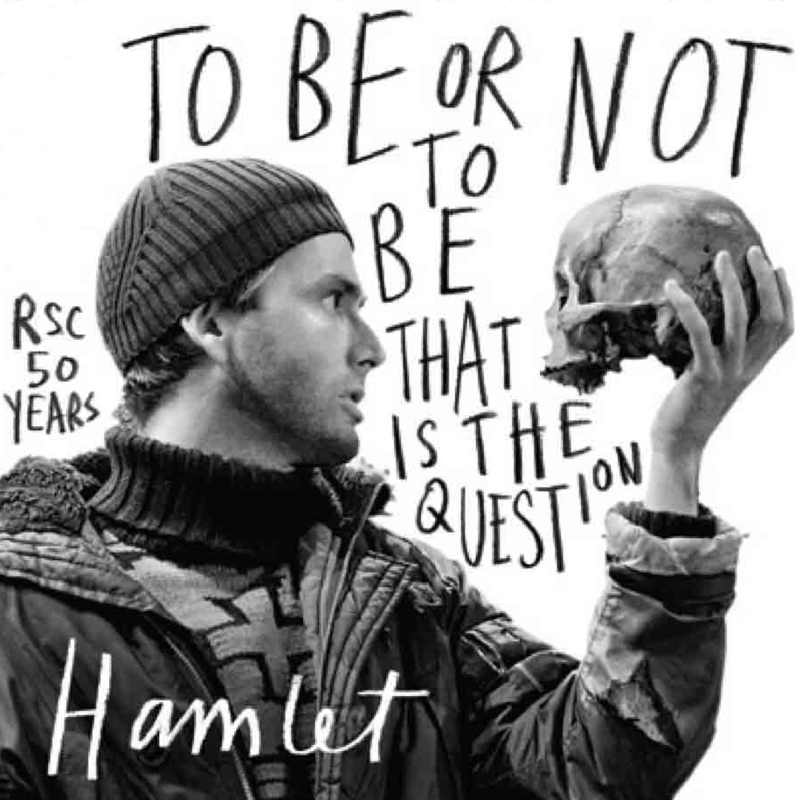 Three star-crossed allies, progressives all, steering ships through a Kinder Morgan tempest no pundit can describe without saying “collision course.” Shakespearean, ain’t it? There’s tragedy, comedy and irony galore. Ms. Notley’s take on A Midsummer Night’s Dream with her midwinter ban on British Columbia wines – which was lifted on Thursday – lent itself so well to “Reign of Terroir” jokes that it can only end up raising the provincial wine industry’s profile. As for Alberta’s oil industry, this is more like Much Ado About Nothing. Whether the oil sands grow or shrink has much less to do with any one pipeline (even one that leads to almighty tidewater) than the global price of oil. What about all those Kinder Morgan jobs? Comedy. Anyone serious about creating oil-sector jobs for Canadians would be pushing to refine bitumen at home instead of exporting it raw. That’s why Unifor, the biggest union in the oil sands, intervened against the project in the NEB hearings. But the notion that Kinder Morgan’s Trans Mountain pipeline expansion would add carbon to the atmosphere is comedy, too. If Kinder Morgan isn’t built, trains will keep moving the bitumen they’re already moving, at least until a higher force than pipeline capacity reduces Fort McMurray’s output. Everyone just makes less money that way. When a country already has more than 840,000 kilometres of pipeline running through it, the fight over roughly 1,000 new kilometres is symbolic for both sides. But symbols matter. Now Trans Mountain has come to symbolize everything from the oil sands to climate change and reconciliation, and everyone’s job is at stake. Premier Rachel Notley of oil rich, but landlocked and economically struggling Alberta. None more than Ms. Notley’s, our likeliest candidate for tragedy. Alberta’s most progressive premier in more than 30 years, the woman who imposed a provincial carbon tax and raised royalties on oil sands operators and lifted Alberta’s minimum wage from the lowest to the highest in the country, Rachel Notley will not be replaced by someone nicer. Alberta’s profoundly oil-positive United Conservative Party, freshly merged and braying at her heels, threaten every last NDP policy with a Trumpian corrective. 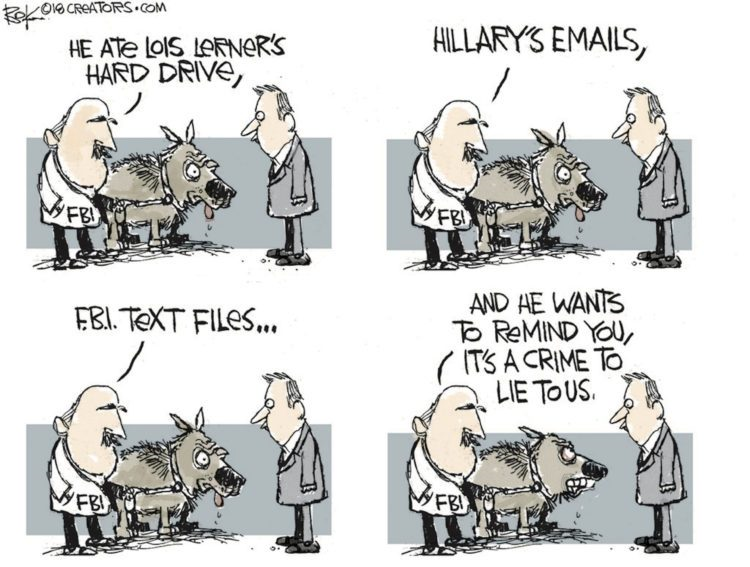 They’ll probably win the next election, too. Ms. Notley’s only hope is in proving to Albertans she can fight as dirty as any conservative would to protect the Symbol. 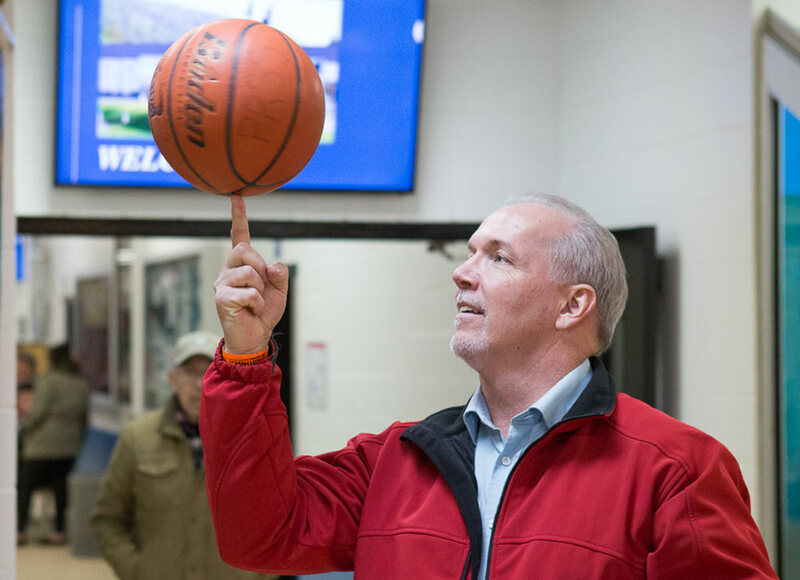 British Columbia Premier John Horgan, who recently formed a government propped up by a few Green party MPs. Enter John Horgan, stage left. Poor guy. He’s running a province whose biggest, greenest city overwhelmingly voted against a once-in-a-generation opportunity to massively expand public transit, but has already proved itself willing to get arrested en masse in anti-Kinder Morgan protests. Mr. Horgan’s first major decision as Premier, the tortured approval of the Site C dam, earned him the condemnation of every environmentalist and First Nation leader in the province, if not the country. 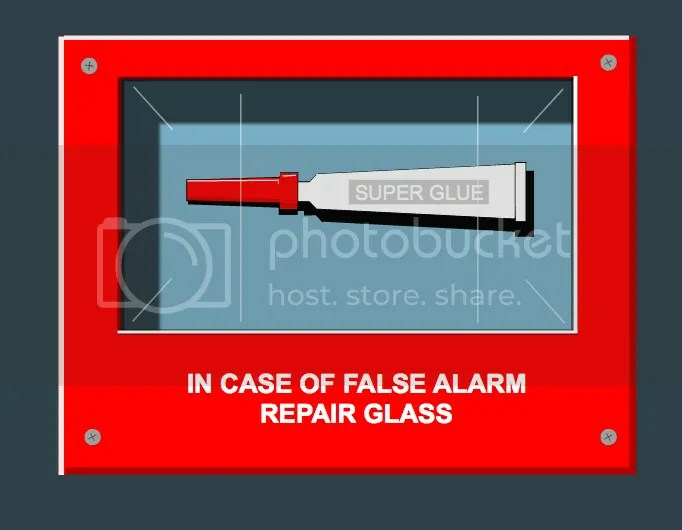 Now that he’s following through on his campaign promise to “use every tool in our tool box” against Kinder Morgan, fans and critics are trading placards. Never mind that Site C will keep far more carbon in the ground than any thwarted pipeline. The thing is, pipeline battles on the coast aren’t about pipelines or even climate change. They’re about oil tankers. Want symbols? Wild salmon and orca populations are rapidly approaching extinction in southern B.C. Yes, oil tankers do already ply these waters. No, we don’t love hearing that the only way to pay for sorely lacking coastal protection is to heighten the risk of an oil spill by tripling the number of tankers. But that’s the deal. Canadian Prime Minister Justin Trudeau currently touring India. Against all that, he weighs the spill risk of one new pipeline, twinned to a pre-existing condition, with a corresponding increase in tanker traffic through relatively safe waters in which oil tankers can so far boast a 100-per-cent safety rate. Without Kinder Morgan, Mr. Trudeau mutters, pacing the stage from left to right, you lose Alberta; without Alberta, you lose your national climate-change strategy, your coastal protections, your whole progressive agenda. You lose everything. Enter, in our closing act, B.C.’s coastal First Nations. Of course, they’ve been here all along – Mr. Trudeau made them some promises, too. But so far, his definition of consultation looks a lot like the old one: a process to determine not if a project should proceed on Indigenous territory, but when. The courts may yet cancel Trans Mountain because of it, as they did Northern Gateway. That’s probably Mr. Trudeau’s best hope for a happy ending. He’s created his own Birnam Wood, an army of First Nations and their allies ready to lead the march to Dunsinane Hill, aka Burnaby Mountain and the terminus of the pipeline, for the biggest act of civil disobedience our generation’s seen. It isn’t a question of if, but when. It always helps to keep in mind that everything is relative. In order to feel superior, you need something to feel superior to. Virtuous relative to what? In order to feel holier than thou you need a thou. 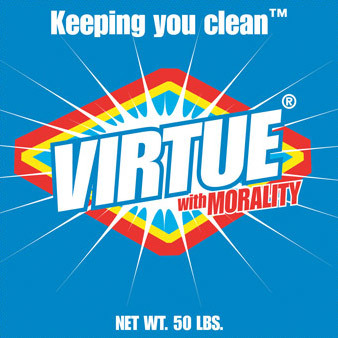 Does virtue signaling accomplish anything outside of the individual? Anything tangible, significant? Any activity as widespread and long-lasting as virtue signaling has to have payoffs. The payoffs for virtue signaling are inner, not outer, directed. The “signaling” part of virtue signaling means you want others to become aware of your virtue. Why is that important to you? Where does your need to signal come from? 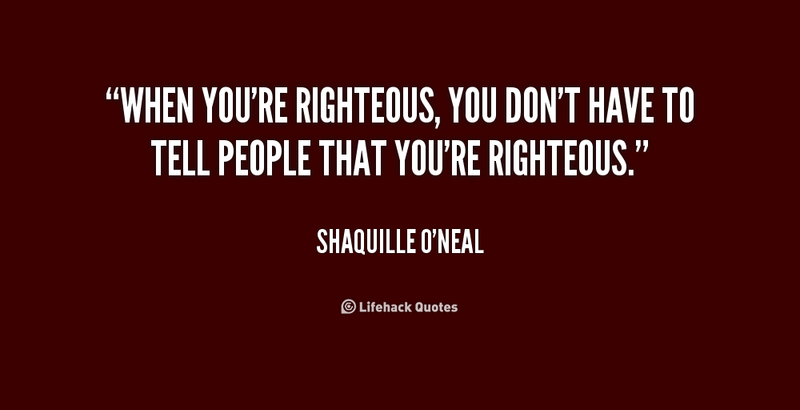 Are you so overwhelmingly virtuous that you can’t resist letting others know about it? Recycling is one of the left’s favorite sacraments. It helps overcome the guilt of consuming. There is an opportunity cost to virtue signaling. Spending time on useless activities, e.g. recycling, marching, allows avoidance of useful, meaningful activities, e.g. being thoughtful and considerate of those around you, e.g. family, friends, and people you work with. Those behaviors can actually make a difference. Maybe you’ve wondered why actors and other celebrities feel the need to publicly express their political opinions. 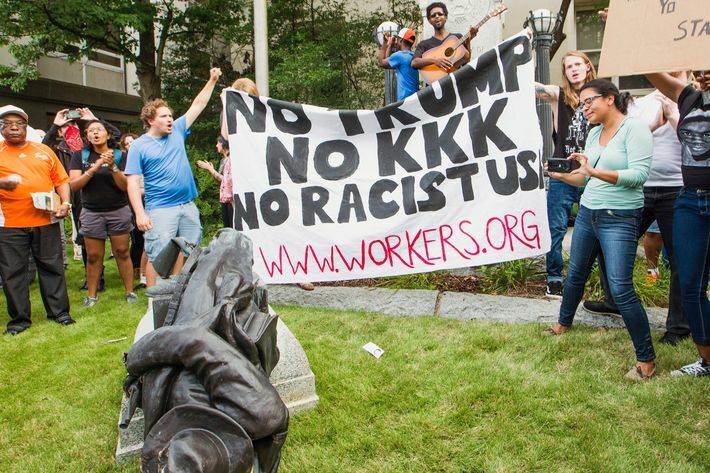 What is their motivation? Maybe they feel guilty about how amazingly wealthy they are (they shouldn’t). Driving a Prius automobile is a popular form of virtue signaling. Driving a hybrid lets others see that you care about the planet and that you’re doing your part to prevent it from being destroyed by CO2. Driving a Prius allows to you drive rudely and carelessly. Cutting someone off or running a stop sign or two are trivial matters compared to saving the planet. Everything’s relative. It’s probably no accident that Priuses have an unusual profile. That helps assure that your virtue signal will noticed. Showing your disapproval of the names or mascots of sports teams demonstrates your sensitivity for the supposed feelings of various minority groups. How many of those demanding that the Washington Redskins change their name are Indians? My guess is that it’s a very small fraction. Wearing ribbons is a popular form of virtue signaling. The ostensible purpose is to “raise awareness” for such things as breast cancer (pink ribbons). Is there anyone who isn’t already” aware” of breast cancer? And once your awareness has been raised, what are you supposed to do with it? As is the case with every variation of virtue signaling, the mission statement is nowhere to be found. Virtue signalers are delicate creatures who are easily offended. They wouldn’t be caught dead laughing at stereotypical humor. They are overly serious about almost everything. It only hurts when they laugh. There is a large element of virtue signaling in environmentalism. Devout environmentalists like to think they’re the only ones who care about the environment. Relative to how much they care about the environment you don’t care much at all. Uselessness and remoteness are two of the ingredients for virtue signaling choices. Driving a hybrid automobile will make not an iota’s difference to “climate change” (whatever that is). In any case, the “climate disruption catastrophe,” as it’s sometimes called, is not predicted to occur for another fifty years. 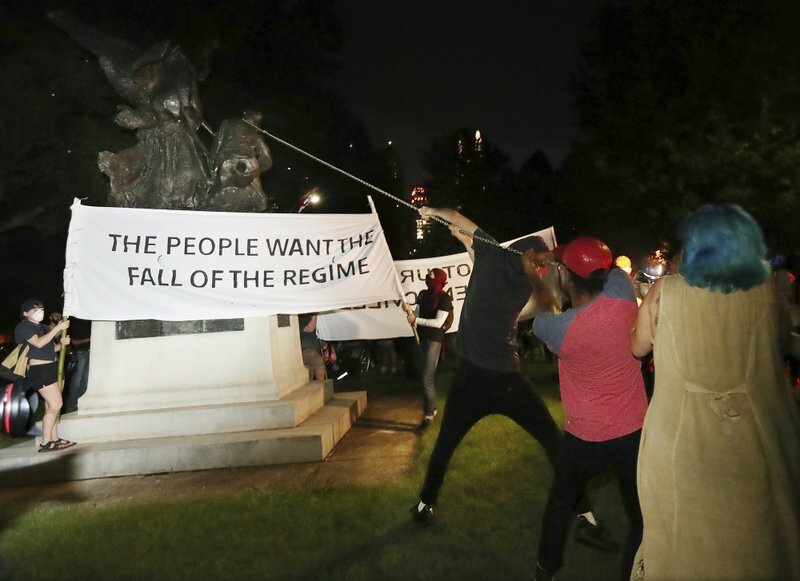 It was more than two hundred years ago when some of our founding fathers owned slaves. The past is unchangeable and irretrievable. Problems that you can’t do a damned thing about are virtue signaling favorites. The Darrow quote crystallized what was making me uncomfortable about the behavior of the Parkland survivors on television. I understand they were scared out of their wits, lost friends and are angry. But the aggressive and threatening language toward anyone not on their bandwagon smacks of self-righteousness, and worse a justification for bullying. 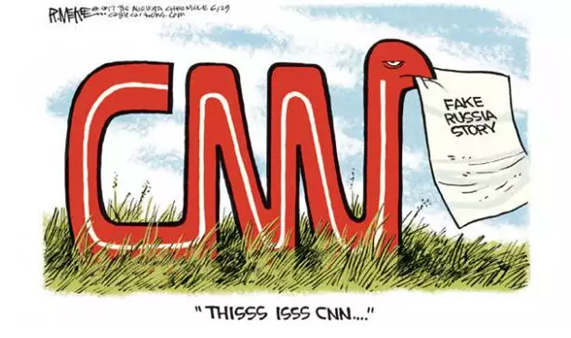 It makes me wonder how much of that helped send the shooter around the bend. 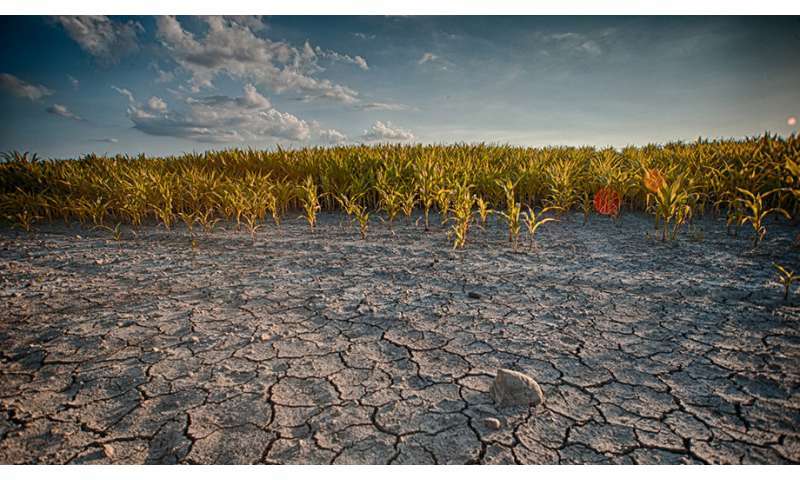 A recent article displays the intersection of fears and facts comprising the climate paradox, in this case the issue of precipitation. Rainfall’s natural variation hides climate change signal appeared today in phys.org by Kate Prestt, Australian National University. Excerpts with my bolds. “Our findings suggest that for most parts of the world, we won’t be able to recognise long term or permanent changes in annual rainfall driven by climate change until they have already occurred and persisted for some time,” said Professor Michael Roderick from the ANU Research School of Earth Sciences. “But the natural variability of precipitation found in this paper presents policymakers with a large known unknown that has to be factored into their estimates to effectively assess our long-term water resource needs.” The research has been published in the journal Proceedings of the National Academy of Sciences. Much like sea level rise, scientists fearing the worst seek and hope to find a nanosignal inside noisy imprecise measurements of a naturally varying phenomenon. 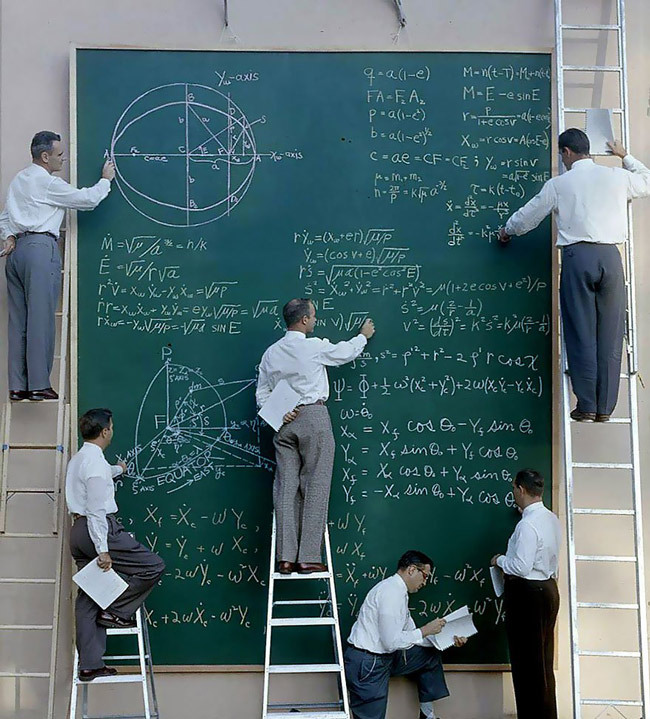 NASA scientists at work in the 1960s. This is a reblog of an article at Popular Science Everything Americans know about science in seven graphs. It is a report on how the country stacked up in a recent National Science Foundation quiz. Text and images below with my bolds. Every two years, a couple thousand lucky Americans get to take a science quiz. The National Science Foundation surveys the representative sample to see how much they (and, by extension, we) all understand about science and technology. And it’s not just for fun. The NSF has a vested interest in figuring out what Americans know, think, and understand about the scientific world so they can construct policies in line with our collective reasoning. So once it’s collected, this survey data gets compiled and put it into one big report. Of course, no survey can perfectly capture how well a person understands science. 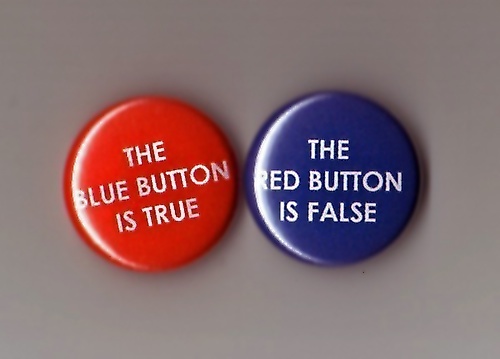 A few questions can’t distill that kind of information; scientific literacy is less about memorizing specific facts than it is understanding how to interpret evidence. But these tests can help us get a snapshot of what Americans do know, and how our understanding is changing. More Americans than ever think climate change poses a real threat to the environment, though the proportion who feel it’s not that bad has stayed around 15 percent. It seems to be the undecided who have come around, not the outright deniers. And unfortunately, the survey also found that only 6 in 10 think global warming is caused by humans—though on the bright side, that’s the highest number ever. (Note: Taking the 50% who think climate change is dangerous times 60% blaming humans gives 30% with the CAGW opinion. The number could be higher if the concerned people also blame humans at a higher rate). Probability A doctor tells a couple that their genetic makeup means that they’ve got one in four chances of having a child with an inherited illness. (1) Does this mean that if their first child has the illness, the next three will not have the illness? and (2) Does this mean that each of the couple’s children will have the same risk of suffering from the illness? Experiment (1) Two scientists want to know if a certain drug is effective against high blood pressure. The first scientist wants to give the drug to 1,000 people with high blood pressure and see how many of them experience lower blood pressure levels. The second scientist wants to give the drug to 500 people with high blood pressure and not give the drug to another 500 people with high blood pressure, and see how many in both groups experience lower blood pressure levels. Which is the better way to test this drug? (2) Why is it better to test the drug this way? Answer: The second way, because a control group is used for comparison. **Scientific Study **(1) When you read news stories, you see certain sets of words and terms. We are interested in how many people recognize certain kinds of terms. First, some articles refer to the results of a scientific study. When you read or hear the term scientific study, do you have a clear understanding of what it means, a general sense of what it means, or little understanding of what it means? (2) (If “clear understanding” or “general sense” response) In your own words, could you tell me what it means to study something scientifically? Answer: Formulation of theories/test hypothesis, experiments/control group, or rigorous/systematic comparison. Despite the wayward influence of Journey to the Center of the Earth, apparently the best-known fact is that the center of the Earth is hot (far too hot to be hospitable, at least). We also seem well-versed in plate tectonics, and about 3 in 4 Americans have figured out that the Earth goes around the Sun. But only 1 in 2 know that it takes a year. Not included here are the questions about evolution and the big bang. The NSF found a small change in those questions had a huge impact on the answers. Adding “according to the theory of evolution” or “according to astronomers” increased the proportion answering correctly to each question. A 2016 study found a similar phenomenon, but substituting a question asking about elephant evolution rather than human—people seemed to understand elephant origins better than human ones. And that suggests that it’s not that people can’t or don’t grasp the theory of evolution, it’s that sometimes scientific principles conflict with a person’s beliefs—and sometimes the beliefs win out. Note: Beliefs also pertain to socio-political movements advancing their agenda using science to persuade. Lysenkoism in the USSR was one example, and the UNIPCC is another. Additional questions in the linked article show such influences, once you understand environmentalism as a quasi-religious construct. Concern over genetically modified food is on the rise, despite the fact that 88 percent of National Academies of Science, Engineering, and Medicine members think they’re safe. Other surveys suggest the public isn’t well-informed about the actual technology involved in creating these crops, which means views are shaped by general perception and worldview rather than scientific evidence. How Dangerous are Nuclear Power Stations to the Environment? The younger you are, the more you think nuclear power stations harm the environment. Accordingly, fewer and fewer Americans support using nuclear energy, though 30 percent still want to prioritize fossil fuel development over alternative energy. Oddly, Gallup data suggests that the nuclear accident at Fukushima didn’t change perspectives much, which could mean that other factors—like “energy prices and perceived abundance of energy sources”—are a bigger priority than safety. How Dangerous are Air and Water Pollution? Education doesn’t have much of an impact on understanding that water and air pollution are dangerous. And really, why would it? The vast majority of people, including adults who dropped out of high school, think that both forms of environmental damage are dangerous (though apparently a graduate degree teaches you to feel it’s more extreme danger). Americans have been waffling about astrology for as long as the NSF has been asking about it. There is, for the record, no true scientific basis for astrology, though there is plenty of evidence that horoscopes only feel like they’re accurate, even when they aren’t. Seminal research from the ‘70s and ‘80s showed that horoscopes are so general that everyone will identify the same personality description as their own, as long as it’s labeled with their astrological sign. Take away that Libra title at the top, and your previously perfect personality description will suddenly feel alien. Some time ago the Onion Magazine article New Report Finds Americans Most Interested In Science When Moon Looks Different Than Usual revealed that Americans interest in science is capricious. Figure 1 depicts EPA’s endangerment chain of reasoning. First, Research Reports failed to find that the steadily rising atmospheric CO2 concentrations have had a statistically significant impact on any of the 14 temperature data sets that were analyzed. The tropospheric and surface temperature data measurements that were analyzed were taken by many different entities using balloons, satellites, buoys and various land based techniques. Second, new information is submitted regarding the logically invalid use of climate models in the attribution of warming to human greenhouse gas (GHG) emissions. Third, new information is submitted relevant to the invalidation of the “Tropical Hot Spot” and the resulting implications for the three lines of evidence, a subject that was also discussed in our original Petition. Now we have a Fifth Supplement (here) which rebuts in detail the “lines of evidence” which claim to prove man-made global warming is causing observable changes in nature. Summary of Rebuttal There has been no detectable long-term increase in heat waves in the United States or elsewhere in the world. Most all-time record highs here in the U.S. happened many years ago, long before mankind was using much fossil fuel. Thirty-eight states set their all-time record highs before 1960 (23 in the 1930s!). Here in the United States, the number of 100F, 95F and 90F days per year has been steadily declining since the 1930s. 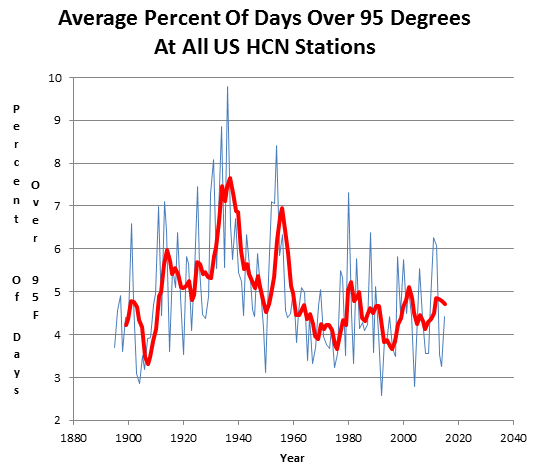 The Environmental Protection Agency Heat Wave Index confirms the 1930s as the hottest decade. Summary of Rebuttal: There has been no detectable long-term trend in the number and intensity of hurricane activity globally. The activity does vary year to year and over multidecadal periods as ocean cycles including El Nino/La Nina,multidecadal cycles in the Pacific (PDO) and Atlantic (AMO) favor some basins over others. The trend in landfalling storms in the United States has been flat to down since the 1850s. Before the active hurricane season in the United States in 2017, there had been a lull of 4324 days (almost 12 years) in major hurricane landfalls, the longest lull since the 1860s. 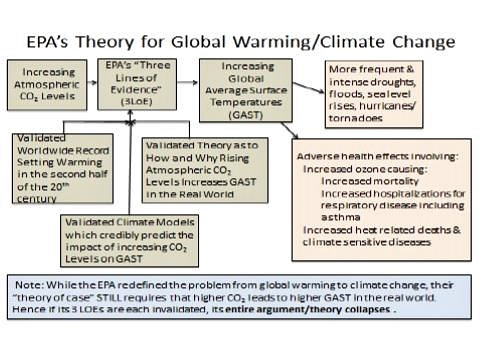 Summary of Rebuttal Tornadoes are failing to follow “global warming” predictions. Big tornadoes have seen a decline in frequency since the 1950s. The years 2012, 2013, 2014, 2015 and 2016 all saw below average to near record low tornado counts in the U.S. since records began in 1954. 2017 to date has rebounded only to the long-term mean. This lull followed a very active and deadly strong La Nina of 2010/11, which like the strong La Nina of 1973/74 produced record setting and very deadly outbreaks of tornadoes. Population growth and expansion outside urban areas have exposed more people to the tornadoes that once roamed through open fields. Summary of Rebuttal Our use of fossil fuels to power our civilization is not causing droughts or floods. NOAA found there is no evidence that floods and droughts are increasing because of climate change. The number, extend or severity of these events does increase dramatically for a brief period of years at some locations from time to time but then conditions return to more normal. This is simply the long-established constant variation of weather resulting from a confluence of natural factors. Summary of Rebuttal Wildfires are in the news almost every late summer and fall. The National Interagency Fire Center has recorded the number of fires and acreage affected since 1985. This data show the number of fires trending down slightly, though the acreage burned had increased before leveling off over the last 20 years. The NWS tracks the number of days where conditions are conducive to wildfires when they issue red-flag warnings. It is little changed. 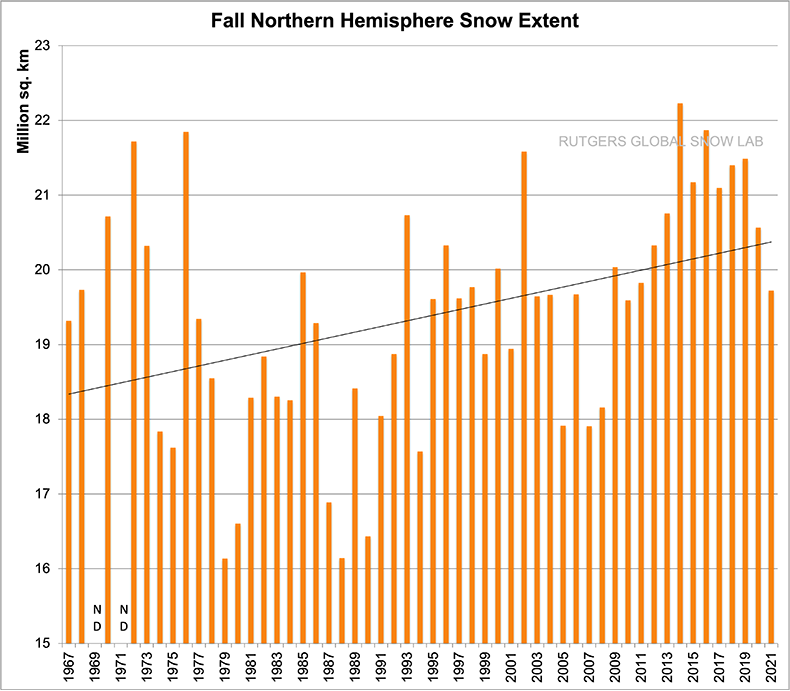 Summary of Rebuttal This is one claim that has been repeated for decades even as nature showed very much the opposite trend with unprecedented snows even to the big coastal cities. Every time they repeated the claim, it seems nature upped the ante more. 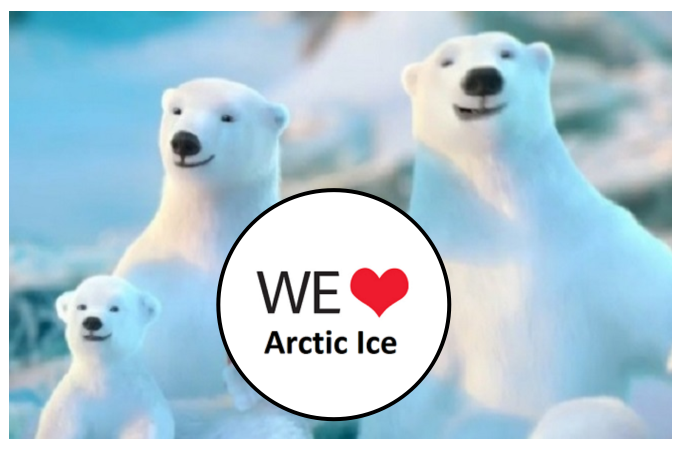 Alarmists have eventually evolved to crediting warming with producing greater snowfall, because of increased moisture but the snow events in recent years have usually occurred in colder winters with high snow water equivalent ratios in frigid arctic air. 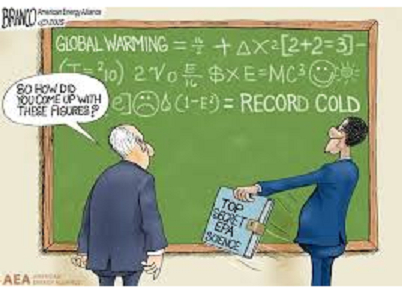 Claim #7: Global warming is resulting in rising sea levels as seen in both tide gauge and satellite technology. Summary of Rebuttal This claim is demonstrably false. It really hinges on this statement: “Tide gauges and satellites agree with the model projections.” The models project a rapid acceleration of sea level rise over the next 30 to 70 years. However, while the models may project acceleration, the tide gauges clearly do not. All data from tide gauges in areas where land is not rising or sinking show instead a steady linear and unchanging sea level rate of rise from 4 up to 6 inches/century, with variations due to gravitational factors. Figure 1. Modelled and observed sea-level changes, 1840-2010. The curve marked “Models” represents the IPCC’s combination of selected tide-gauge records and corrected satellite altimetry data. The curve marked “Observations” represents the observed eustatic sea level changes in the field up to 1960 according to Mörner (1973) and (in this paper) thereafter. After 1965, the two curves start to diverge, presenting two totally different views, separated by the area with the question mark. Which of these views is tenable? Summary of Rebuttal Satellite and surface temperature records and sea surface temperatures show that both the East Antarctic Ice Sheet and the West Antarctic Ice Sheet are cooling, not warming and glacial ice is increasing, not melting. Satellite and surface temperature measurements of the southern polar area show no warming over the past 37 years. Growth of the Antarctic ice sheets means sea level rise is not being caused by melting of polar ice and, in fact, is slightly lowering the rate of rise. 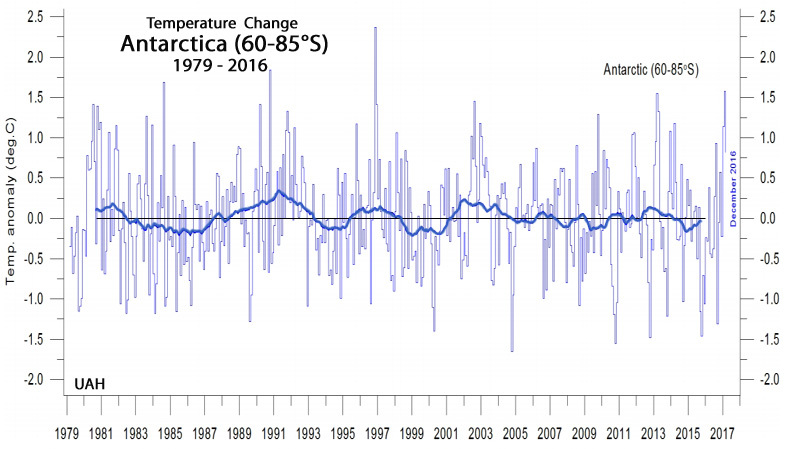 Satellite Antarctic temperature records show 0.02C/decade cooling since 1979. The Southern Ocean around Antarctica has been getting sharply colder since 2006. Antarctic sea ice is increasing, reaching all-time highs. Surface temperatures at 13 stations show the Antarctic Peninsula has been sharply cooling since 2000. Summary of Rebuttal As the air’s CO2 content rises in response to ever-increasing anthropogenic CO2 emissions, more and more carbon dioxide is expected to dissolve into the surface waters of the world’s oceans, which dissolution is projected to cause a 0.3 to 0.7 pH unit decline in the planet’s oceanic waters by the year 2300. The ocean chemistry aspect of the ocean acidification hypothesis is rather straightforward, but it is not as solid as it is often claimed to be. For one thing, the work of a number of respected scientists suggests that the drop in oceanic pH will not be nearly as great as the IPCC and others predict. And, as with all phenomena involving living organisms, the introduction of life into the analysis greatly complicates things. When a number of interrelated biological phenomena are considered, it becomes much more difficult, if not impossible, to draw such sweeping negative conclusions about the reaction of marine organisms to ocean acidification. Quite to the contrary, when life is considered, ocean acidification is often found to be a non-problem, or even a benefit. And in this regard, numerous scientific studies have demonstrated the robustness of multiple marine plant and animal species to ocean acidification—when they are properly performed under realistic experimental conditions. Graph showing a typical oceanic situation. Over a 60 day period, pH fluxes are far greater than claims of global shifts toward 7 (neutral) or lower (acidity). Summary of Rebuttal The term “carbon pollution” is a deliberate, ambiguous, disingenuous term, designed to mislead people into thinking carbon dioxide is pollution. It is used by the environmentalists to confuse the environmental impacts of CO2 emissions with the impact of the emissions of unwanted waste products of combustion. The burning of carbon-based fuels (fossil fuels – coal, oil, natural gas – and biofuels and biomass) converts the carbon in the fuels to carbon dioxide (CO2), which is an odorless invisible gas that is plant food and it is essential to life on the planet. VOC refers to “volatile organic compounds” meaning any compound of carbon produced from burning fuels, excluding carbon monoxide and carbon dioxide. The linked documents above provide more details on EPA’s “secret science”, as well as posts on this blog addressing many of these topics. 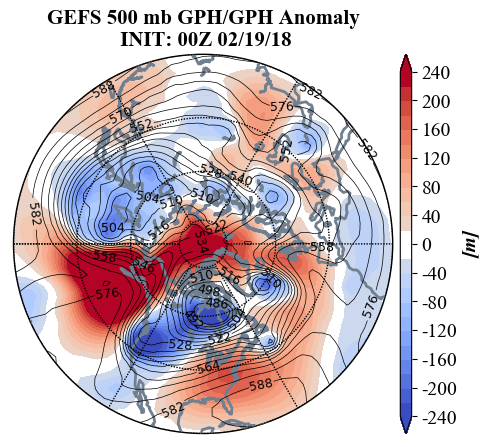 Dr. Judah Cohen covers the latest vortex shaninigans and implications for future weather at his always informative website Arctic Oscillation and Polar Vortex Analysis and Forecasts February 19, 2018. Excerpts below with my bolds. Video above of nullschool wind patterns from October 2017 up to yesterday, showing the vortex splitting as described below. The stratospheric PV remains split into two pieces with one dominant center over Western Canada and a second much weaker center over northwestern Europe (Figure 12). The Eurasian center is predicted to retrograde westward and dissipate while the North American center slowly drifts north towards the North Pole and even possibly into Eurasia. The most persistent legacy of the PV spit is above normal geopotential heights and warm temperatures in the polar stratosphere. This is reflected in the stratospheric AO, which is predicted to remain negative over the next two weeks, though slowly trend back to neutral (Figure 1). As I have discussed in previous blogs there seems to me to be two responses to a significant PV disruption: an immediate response and a longer term response. When the PV split it created two sister vortices a dominant center over North America and a more minor center over Eurasia. In between the two PV centers high pressure filled the void but was shifted towards the Eurasian continent. Across Eurasia the immediate and longer term response seem to be consistent. The immediate tropospheric response or at least the tropospheric circulation related to the PV split has been high pressure/heights to the north, low pressure/heights to the south, predominant anomalous easterly flow and below normal temperatures across northern Eurasia. Figure 2. Observed 500 mb geopotential heights (dam; contours) and geopotential height anomalies (m; shading) for 00Z 19 February 2018. In contrast the immediate and longer term response across North America do not seem to be the same. When the PV split into two pieces the dominant sister center formed over Western Canada and has been spinning in place in the polar stratosphere. It appears to me this has contributed or at least is related to troughing/negative geopotential height anomalies across Canada and then eventually into the Western US accompanied by colder temperatures. This in turn has forced further downstream across eastern North America ridging/positive geopotential height anomalies, southwesterly flow and mild even record warm temperatures. Eventually however the Eurasian PV sister center is predicted to weaken and dissipate leaving just one PV center over Western Canada. That PV center is predicted to make its way back to the North Pole or alternatively there are some model forecasts of the PV center being further displaced towards Eurasia. Longer term the tropospheric response seems to be less about the initial displacement and the associated circulation around the respective PV centers and more about the warming and high pressure/heights related to that warming. The corresponding tropospheric response is high pressure and relatively warm temperatures over the Arctic. With respect to the ongoing event the high pressure and warm temperatures in the polar stratosphere are centered over Greenland and therefore it seems likewise in the troposphere the high pressure/heights and warm temperatures will be centered over Greenland. This transfer of high pressure/heights and warm temperatures over the Arctic is seen in the apparent downward propagation of positive/warm polar cap geopotential heights and/or a negative AO from the mid-stratosphere eventually down to the surface. On average this downward propagation or transfer takes about two weeks. Figure 5. (a) Forecasted average 500 mb geopotental heights (dam; contours) and geopotential height anomalies (m; shading) across the Northern Hemisphere from 25 February – 1 March 2018. (b) Same as (a) except averaged from 2 – 6 March 2018. The forecasts are from the 19 February 2018 00z GFS ensemble. Therefore in summary based on my reasoning, the immediate response to a PV disruption is somewhat random dependent on the displacement of the PV center(s) and the circulation around the PV center(s). For the current event the immediate tropospheric response related to the location and circulation of the North American sister vortex favors relatively cold temperatures in western North America and mild temperatures in eastern North America. However the tropospheric response could have just as likely been the opposite favoring relatively mild temperatures in western North America and cold temperatures in eastern North America. Across Eurasia the immediate response favors relatively cold across northern Eurasia and mild temperatures across southern Eurasia; though it does seem that the immediate response across Eurasia is less random than for North America for reasons that I don’t fully understand. The longer term response or legacy however to a PV disruption is less random and is not as dependent on the location and circulation of the PV center(s) but rather on the warming and building of high pressure/heights across the Arctic which shows greater similarity across PV disruption events. High pressure/heights and warm temperatures favor colder temperatures in preferential locations: the Eastern US, Northern Europe and East Asia resulting in a warm Arctic/cold continents pattern. Therefore my expectations of the longer term response to the ongoing PV disruption is the same – a preference for relatively cold temperatures in the Eastern US, Northern Europe and East Asia over the coming four to six weeks starting the very end of February or the beginning of March. Forecast for the next month from Environment Canada. The ramifications of the recent indictments are explored by California attorney Robert Barnes writing Feb. 17 in the journal Law and Crime Does Mueller Indictment Mean Clinton Campaign Can Be Indicted for Chris Steele? Text below with my bolds. Robert Barnes is a California-based trial attorney whose practice focuses on Constitutional, criminal and civil rights law. Don’t overlook the implication in the final paragraph, namely that expressing opinions about candidates is protected free speech, even for foreigners. Mueller presents indictments he will never have to prove in court to create the appearance of a crime. His circus needs a crime as justification, and to go after targets for conspiring or lying about that “crime”. It is a clever, but flimsy legal fiction, as Barnes shows it could apply to a lot of political discourse. And social media is an unlikely place to apply some legal standard, since people, robots and puppets say all kinds of things often hiding behind handles. In case you have forgotten, Dave Chappelle reminds us what the internet is like in the classic video What if the internet was a real place?